Following the massive German offensive unleashed in Friuli (Italy) on 27 September 1944 from Tricesimo and Tarcento eastwards, after two days of heavy fighting the Italian partisan brigades, and with them the British SOE (Special Operations Executive) COOLANT mission as well, were forced to withdraw eastwards up to Pulfero, stronghold of the Slovene IX Korpus partisan army. Unfortunately, COOLANT mission’s radio batteries were lost during the retreat, and British commander Major Hedley Vincent urgently needed to contact his base to report about the situation and to ask for some supplies. The British Major and his men had then to accomplish three sorties to the mountain monastery of Castelmonte, at the very limit of the territory held by the Germans, being the nearest village with electricity (actually, the very first met by the COOLANT mission to benefit from this utility ), in order to be able to operate their radio and to contact their headquarters. The radio set  was thus successfully positioned in the small Castelmonte inn, while the antenna was erected on the nearby monastery, taking a very high risk both for the British and for their hosting monks. Between 28 September and 15 October 1944 at least three messages (nicknamed ‘schedules’ or ‘skeds’) could thus be transmitted to the Monopoli radio station, where the headquarters of SOE No. 1 Special Force stationed at the time . In response to the requests of COOLANT, an air supply sortie was scheduled from RAF 334 Wing headquarters. On the evening of 16 October a lonely B-24 Liberator of the USAAF 885th Bombardment Squadron took off from the Brindisi airbase for a Special Duty mission . The aircraft was loaded with sixteen standard containers filled up with supplies and with four additional packs, in addition to 200 lb (91 kg) of ‘nickels’ (propaganda leaflets) . Its primary target was the Dropping Zone (DZ) codenamed BEAVERTON, located at coordinates 46° 12’ 30” N, 13° 21’ 37” E and attended by both the Italian partisans and the men of British liaison mission. The coordinates correspond to a clearing at the bottom of the valley on the southern side of the Jôf di Cergneu, a small woody mountain chain formed by the low and gentle peaks of Mounts Iauer, Nagrada and Rep. 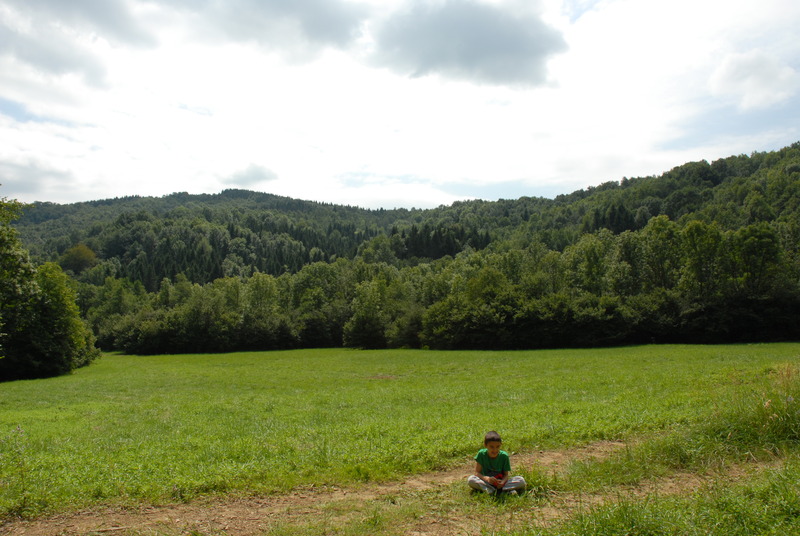 The meadow that covers the glade, today rather small in size but in 1944 probably far more extensive, is crossed by the stream Černa Voda, which flows just down into the Lerada river. The glade is located at an altitude of 688 meters and it is easily accessible from the road leading from the small village of Subît to the one of Prossenicco. The place is located near the Porzûs (or Mount Topli Uork) meadows, north of the village of Canebola, where at that time the partisan Division Osoppo-Friuli had its headquarters. It is also very close to the hamlet of Stremiz where the main partisan force of the Garibaldi-Natisone Division had its headquarters too. In fact the BEAVERTON dropping zone was attended, in the last year of war, by both partisan groups . The orographic conformation of BEAVERTON was typical of the dropping zones chosen and used by allied missions for partisans’ supply. The wood, which today has taken over, in 1944 was probably much more backward and left room for a wide meadow valley. The BEAVERTON dropping zone (46° 12’ 30” N, 13° 21’ 37” E) as it is today, shot southwards in the direction of Mount Merzli Uork . The secondary target for the sortie, which in some missions was assigned together with the primary one, was the area codenamed EATON, located at 45° 58’ 00” N, 12° 44’ 42” E (fields near Zoppola, Pordenone) . The route assigned to the B-24 involved crossing the Adriatic Sea northwards starting from the Brindisi airbase and then, on the islet of St. Andrews (Sveti Andrija or Svetac, 43° 01’ 30.9” N, 15° 44’ 51.1” E), a detour towards the west on Punta Salvore (Savudrija) cape (45° 29’ 23.9” N, 13° 29’ 27.9” E) to finally go northwards deep into the Italian territory . The lighthouse that today still stands on the nothern landmark was built in the 19th century. It probably worked even in times of war and was very likely to be taken as a reference point for the purpose of air navigation as well. The aircraft was the B-24J Liberator 42-51778, piloted by First Lieutenant Jerome L. Solomon. The ship was on its tenth mission with 885th BS. Lieutenant Solomon was flying his fourth mission as a pilot with the special squadron. He had already completed a sortie on the BATESBURY dropping zone (located in Zovencedo, near Vicenza) on the night between 11 and 12 October 1944, another one on JETTISON AREA (located near Gallio di Asiago, Vicenza) in the night between 12 and 13 and a third one on ESTIL (Montepulgo, Vicenza) in the night between 13 and 14 . Waiting on the ground for the supplies to be dropped were the partisans of the Garibaldi Natisone Division , flanked by the men of COOLANT mission . They had received confirmation of the impending drop by a coded radio message (or ‘crack’), probably ‘Le scarpe sono rosse’ , transmitted on the same day by the BBC-controlled Bari station in the special messages section, which was broadcast daily prior to the reading of Italian news . Original audio recording of a 1944 Italian BBC ‘crack’. Click to play. COOLANT mission was one of the few equipped with an ‘Eureka’ electronic transmitter ,  which formed a radio beacon system intended to ease the spotting of the ground reception party by the aircrews; it had its counterpart device, called ‘Rebecca’, mounted on board of the 885th BS aircrafts. In general terms, both the liaison missions on the ground and the special duty air squadrons were equipped with the most advanced military technologies available at the time: this tells how important these activities were considered by the Allies. The partisans and the British mission returned to their Stremiz headquarters on the very 16 October, following the retreat of the Germans. Some days later, the mission would have been taken over by British Major Ronald Thomas ‘Tommy’ Stewart Macpherson and radio operator Sergeant Oswald Arthur Brown, from SOE No. 1 Special Force; they parachuted on BEAVERTON from RAF Handley Page Halifax II JP 242, Polish Wing, on the evening of 4 November 1944, not without some hitch . The two British would have been with the partisans, this time attached to the command of Osoppo-Friuli Division, until the liberation of Udine, on the 1 May 1945. Sergeant Brown, in his unpublished memories, remembers that during the winter spent among the Friulian mountains, constantly escaping from German and Cossack roundups, the British mission and the small group of partisans who accompanied it constantly suffered hunger and a very intense cold . 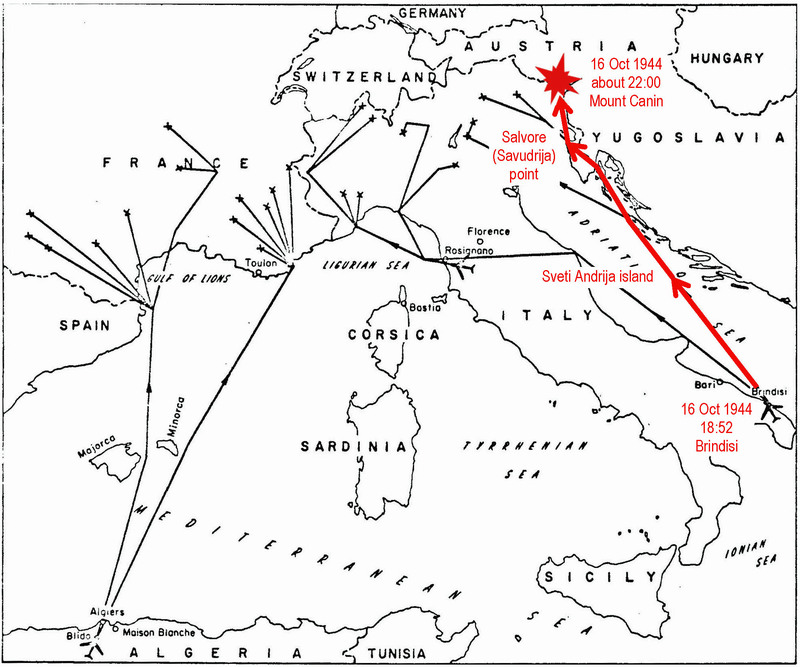 This sortie was therefore a secret operation carried out to Italian partisans by a special American aircraft, loaded by evacuee Yugoslavian troops , supported by a British mission that included a Czech polyglot interpreter  and which had parachuted from an aircraft of a Polish squadron. This represents the multinational character that special operations had assumed in the last stages of the war in Europe. In the Mediterranean theatre were present more nationalities than in any other area of combat: among the many other units, British, American, South African, Italian, Polish and Soviet aircrews carried out special missions to supply partisans under the supervision and the operational coordination of 334 Wing RAF , . On 16 October 1944, in the morning, everyday warlife had started as usual in the allied Brindisi, Italy airbase. All the Special Duty aircrafts had returned during the night time back from their missions. After the usual debriefing, the crews were now resting. At 15:00 the targets for the missions of the day had been assigned by the headquarters of 334 Wing RAF. Weather conditions on the route and in the target area were pointed out by the British Met (Meteorological) Officer: unstable weather conditions had been reported in the target area . The updated flak  situation in the Balkans was then briefed by an intelligence officer. As usual, each crewmember had been handed a surviving kit (also called ‘escape aids’) . The crew then synchronized their watches, as usual. Perspective view of the massif of Mount Canin taken from Udine northwards. The BEAVERTON dropping zone is on the foreground hills, at the right of the picture . The airplane took off from Brindisi regularly at 18:52 and maintained radio silence throughout the route to the target, as was the practice for special missions. It was allowed to use the radio transmitter only in case of emergency: dedicated to this aim, at the base there were radio operators constantly listening on a dedicated frequency. On the other way, constant dispatches with weather upgrades and other information were broadcast from the Brindisi airbase and silently listened to by the aircraft radio operators. On that evening, at about 22:00, over the BEAVERTON dropping zone an airplane drone was heard but nothing could not be sighted . The heavy bomber had covered a route of some 800 miles (1,290 kilometers). Shortly after in the val Resia villages, not so far away, a rumble of engines was briefly heard and then a violent roar happened . The B-24 had crashed on a rocky wall that is part of the south buttress of Mount Canin, below the summit of the Porton sotto Canin (Čez Dol) peak, at an altitude of about 6,230 feet (1,900 meters). Most of the wreck rolled then downstream, along the canyon where the Toudùle torrent flows. A flashy fire developed on the site of the crash ; many following explosions accompanied the fire throughout the night between 16 and 17 October. The Casera Canin hut, which still exists today, is situated a few hundred meters away from the spot of the accident. The herdsmen who were billeted there that night reported that they heard some yelling immediately after the incident. Then nothing more . It is very reasonable to assume that the Liberator missed its target during the low-altitude approach to Beaverton, going over ten miles (fifteen kilometers) further north as the crow flies and coming up to the area of Mount Canin where, due to very bad weather and very low visibility, it was unable to avoid the collision with rocks . The fact that no distress radio call was received from the crew testifies that the accident was sudden and unexpected. The route followed by the B-24 J 42-51778 on the evening of 16 October 1944. Topographic map of the area with the approximate indication of the spot of the accident [about 46° 21′ 04″ N 13° 25′ 56″ E] . The bomber was a Consolidated B-24J-10-FO Liberator. It had been built in the Ford Willow Run plant, carrying 42-51778 serial number. It had initially been assigned to 15th Air Force, 49th Bombardment Wing, 461st Bombardment Group (Heavy), 766th Squadron. On 30 August 1944 the aircraft had been transferred to the 885th BS and probably had passed through the USAAF El Aouina, Tunisia depot, in order to be modified and painted all-black according to the specifications of the new special unit. The aircraft had been assigned the ‘W’ Radio Call Letter. In the official logs of the 885th BS, the ship is reported as “778 W” in order to distinguish her from another B-24, the “778 V”, belonging to the same squadron and happening to have the same three final digits from the serial number. It was the B2 radio set, the standard radio equipment of the SOE missions. NARA, RG 18 E 7A B 3672. 885th BS (H) (S); Sortie Report, Operation No. 89, 16/17 October 1944. Each target was conventionally identified by a circular area with a radius of 5 miles (8 km); the reference geographical coordinates of the DZ corresponded to the centre of the circle. MacCloskey (1945). The exact launch point could vary within the circular area and was identified, from time to time, on the spot with ground light signals. 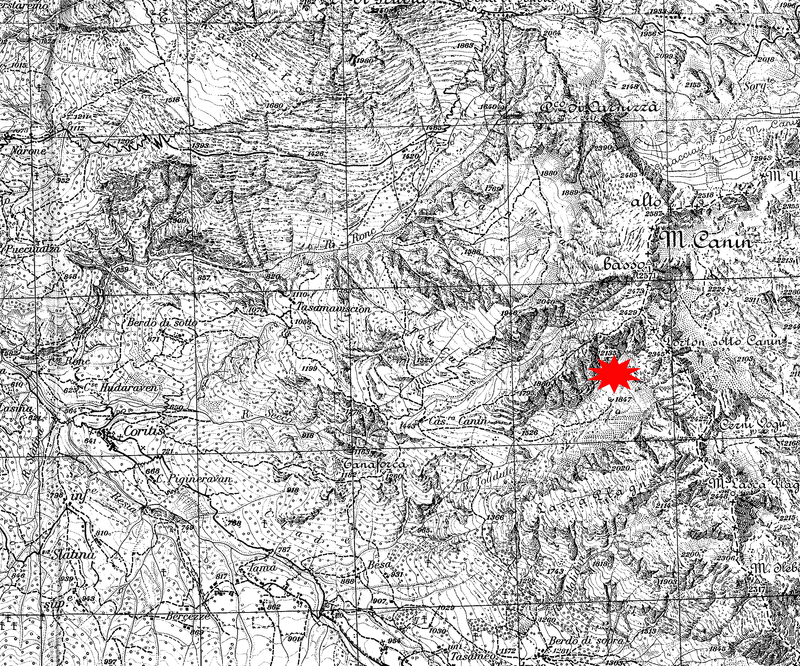 In some British reports BEAVERTON DZ is identified with dropping ground ‘J’ for JOHNNY and the exact dropping point is told to be on the southern slope of Mount Joanaz, being distant some 5 kilometres from the official coordinates. MacCloskey (1945), List of October 1944 Operations, p. 3 and List of Positions of Targets. Hanson (1944), USAAF Missing Air Crew Report No. 9679. MacCloskey (1945), List of October 1944 Operations, p. 1 – 3 and List of Positions of Targets. – Maj. Nicholson, Capt. Tolson, Lt. Piave and Cpl. Laybourne, parachuted on the summit of Mount Joanaz on 20 September 1944 with two men belonging to ISLD (Inter-Services Liason Department; it was the cover name used for British SIS, Secret Intelligence Service or MI-6, for operations in occupied Europe). Godwin (1990), p. 175; Padoan (1983), p. 177; Vincent (1944), p. 1 and 2. ‘The shoes are red’. Hargreaves (1987), p. 168. The BBC (British Broadcasting Corporation) broadcast every day at regular times a radio transmission called ‘Special messages’ containing coded messages for the various Resistance groups and the liaison missions spread all over Italy. The transmission begun with the phrase ‘Parla Londra. Trasmettiamo alcuni messaggi speciali’ that is ‘This is London speaking. We are going to transmit some special messages’. By the end of November 1944 only two partisan groups in Italy were equipped with Eureka; Condit (1954), p. 31. Macpherson (1945). Report on COOLANT mission, p. 5. Brown (1987), p. 4; Macpherson (2010), p. 165; RAF No. 1586 Polish Flight, Operations Record Book, November 1944. TNA, document AIR 27/1660. In October 1944 the loading of aircrafts of 885th BS was carried on by Yugoslavian enlisted men from ‘Paradise Camp’, the main British packing station in Italy. They were mostly wounded partisans who had been evacuated from Yugoslavia and were at the time recovering in Italy. Cpl. Michael Trent (also known as Micky or Nicholas), whose real name was Issack Gyori, born in 1919 in Czechoslovakia and naturalized as a British; before the war he was a journalism student at the Bratislava university and he is reported to be fluent in English, Italian, Slovene, Croatian and Friulian. He had been recruited from the British Army in Palestine, with Army Service Number PAL/275. Brown (1987); Macpherson (2010). He also became the official photographer of Coolant mission. Vincent (1944), p. 28.
 flak was the short name used for Flugabwehrkanone, the German Anti-Aircraft Artillery. NARA, RG 342, E 1006, B 24, reel A0676. 885th Bomb Squadron, Staff Journal, 16/17 October 1944. MacCloskey (1945), Historical Outline, October 1944, p. 5. Condit (1954), p. 40. On that night, nine out of the thirteen sorties tried by the 885th BS were unsuccessful due to very bad weather. Istituto Geografico Militare (1937), Map of Italy 1:25.000, sheet 14, plate ‘Monte Canin’.